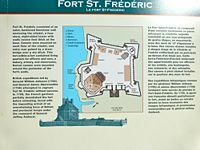 Fort St. Frederic (1735-1759) - A French Colonial fort established in 1735 in present-day Essex County, New York. Named for the French Count Maurepas (Jean-Frederic Phelypeaux) who was the French minister of the colonies, the navy, and seaborne trade. The fort was blown up by the French and abandoned in 1759. 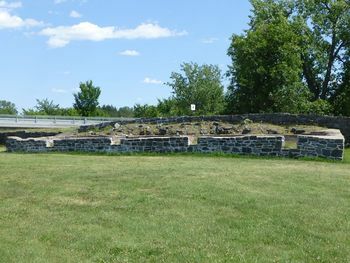 Ruins of Bastion du lac Champlain. 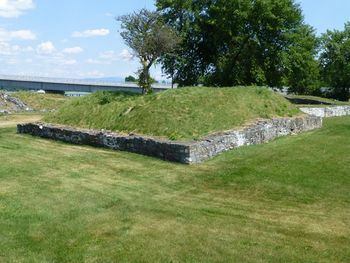 Fort St. Frederic Site with the Lake Champlain Bridge in the Background. Fort St. Frederic was sited on the west side of a narrow gap at the head of Lake Champlain on Crown Point. The French had earlier established a small stockaded fort on the east side at Chimney Point. The gap between Crown Point and Chimney Point was less than a half-mile wide and the new fort could control any traffic up or down the lake. Construction began in 1735 and was completed in 1737. The stone fort was some 300' square with six named bastions, three bastions protected a four-story, eight-sided stone citadel in the north corner. Watch boxes were located at the tip of each of the four corner bastions. Inside the citadel, cannons were mounted on each floor and the entrance included a ditch and drawbridge. The fort was planned to mount some 62 cannons with about a 100 man garrison. The fort became the center of French activity along the lake and in 1750 the French established a second stockaded fort further south naming it Fort Vaudreuil, which they later built into the stone Fort Carillon which later became Fort Ticonderoga. The British began to challenge the decades of French expansion during the French & Indian War. First Fort Carillon fell and then Fort St. Frederic came under attack in July 1759 by British General Jeffery Amherst and his army of 12,000 men. The French abandoned Fort St. Frederic, blowing up a redoubt and a windmill in the process but a good bit of the fort remained. Amherst ordered the old fort leveled and began construction of a massive new fortification on an adjacent site. The new fort became Fort Crown Point. Part of Crown Point State Historic Site Park, Essex County, New York. Ruins and markers, no period guns or carriages in place. Ruins adjacent to the ruins of Fort Crown Point. Location: Crown Point State Historic Site, Essex County, New York.